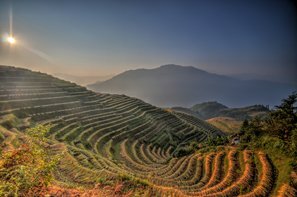 The Longsheng Rice Terraces, also called the Longji Terraced Fields or Dragon&apos;s Backbone Rice Terraces, offer some of the most fantastic scenery in China or indeed the world. Best time: spring and autumn, especially May or October, for watery or rice-filled terraces. Read on to find out the best spots for rice terrace scenery, best times to visit, and more. The Longji Rice Terraces cover several village areas in Longsheng: Ping&apos;an, Jinkeng (Dazhai), Ancient Zhuang Village (Guzhuangzhai), Huangluo Red Yao Village, etc. 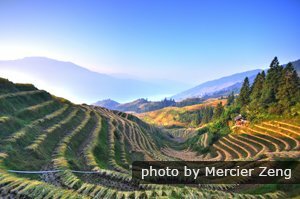 The Longji Rice Terraces cover several village areas in Longsheng County. 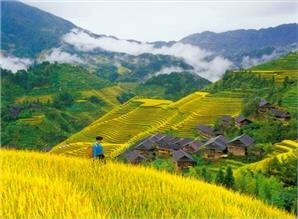 The most popular terraced field areas are around Ping&apos;an (&apos;Peace&apos;) village, where Zhuang minority people live, and the Jinkeng (&apos;Golden Hollow&apos;) area, home to the Red Yao. The Ping&apos;an Zhuang Village Terraced Fields (平安壮寨梯田) are the first rice terrace area in Longsheng to be developed for tourism. They have the most roads/paths, hotels, and facilities. It&apos;s the most touristy area. The terraced fields are around Ping&apos;an Village and two smaller hamlets, inhabited by the Zhuang minority. The villagers live in traditional wooden three-story stilted houses. The area is well-equipped with modern facilities, where dining, accommodation, and transportation are very convenient with over 80 hostels and hotels available. It takes about one hour to walk from the car park to the rice terrace view spots above Ping&apos;an. Don&apos;t worry if you are not fond of walking, we can arrange a car to take you up there. But we still recommend walking, as you will have different views of the village and the terraced rice fields at every turn. Seven Stars Accompany the Moon (七星伴月), which is comprised of seven small piles of rocks, left there when the area was developed, in the middle of a moon-like field. It is a perfect place for photography. Nine Dragons and Five Tigers (九龙五虎) or just Nine Dragons, which refers to nine ridges, branching off from the main ridge, which look like nine dragons bending over to drink from the Jinsha River. Alongside, there are five "tiger-like" rocks. The Jinkeng Terraced Fields are farther from the tourist entrance than the Ping’an Terraced Fields. The rice terraces are much higher and larger than the Ping&apos;an rice fields. There are cable cars going from the car park to Golden Buddha Peak (one of the best views spots). It is a good option for travelers who are not good at walking to enjoy the scenery. Golden Buddha Peak is an hour&apos;s walk from the accommodation, so the cableway is not very convenient for getting to hotels. Hotels: It takes about 10 minutes to walk from the car park to Dazhai village at the foot of the rice terraces. There are hotels at the foot, in the middle, and near the top of the rice terraces. Hotels at the top of the rice terraces require 1½–2 hours&apos; walking from the car park. Don&apos;t worry if you wish to stay at hotels at the top of the rice terraces, or if you are not good at walking, we will arrange a car to take you to up to the middle (the roads don’t go any higher). Also don&apos;t worry if you have a lot of luggage: we can arrange the Red Yao women with back baskets to help you. &apos;West Hill Music&apos; (Xishan Shaoyue 西山韶乐), which is the highest point on the terraces (altitude 1,180 m; 3,870 ft) with the broadest panorama. Popular for sunrises and sunsets, it takes two hours to walk there from Dazhai. More than 90% of published Longsheng rice terrace photos are taken there. The &apos;Large-Scale Thousand-Layer Terraces’ (Dajie Qianceng Titian 大界天层天梯), which are relatively low and easy to climb to, as the paths are good. The terraces are fantastic and you can see the Yao people&apos;s houses. It is an excellent place to see a sunrise. ‘Golden Buddha Peak’ (Jinfo Ding 金佛顶), the best place to take sunset photos. The cableway from the car park, an hour&apos;s walk below Dazhai, to the peak is very welcoming for those who are not good at walking, or those who would prefer not to hike up/down (20 minutes instead of 2-3 hours of walking). Longji Old Zhuang Village (龙脊古壮寨), 3 km (2 mi) southwest of Ping&apos;an Village, is the most traditional and least modernized Zhuang minority village in Longsheng. It is the top choice for those interested in history and culture. The village boasts the oldest and the largest stilted building group in Guangxi Province. Huangluo Red Yao Village (黄洛红瑶寨), 1 km south of Ping&apos;an, is known as the ‘World&apos;s Top Long Hair Village&apos;. It is a tradition for girls to wear long hair in Huangluo, and over 60 women have over-one-meter-long black hair. The longest is 2.1 meters! There are long hairs shows at this village, but we don&apos;t arrange the shows for our customers as they are not natural, and too commercial. 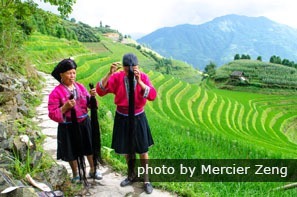 If you are interested in this village, our guides are happy to take you there and facilitate a more rewarding time with the Red Yao and explanation of their culture. Our customers chatting with a local woman. Our guides help with translations. Dazhai to Ping&apos;an: 4-5 hours. 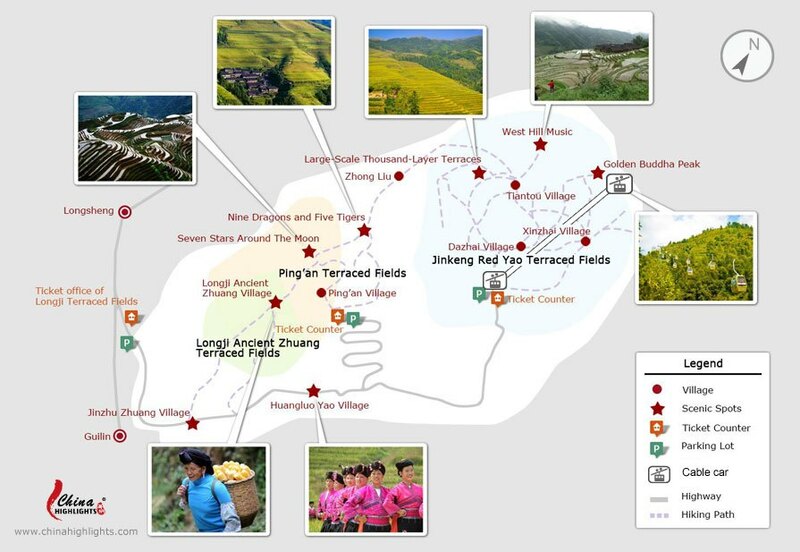 See Longji Terraced Fields hiking guide. There are a considerable number of small paths, which may easily lead to getting lost, so a tour guide may be necessary to help you find the right way. The uncut stone paths have many twists and turns, and some sections are steep, so please mind your step. 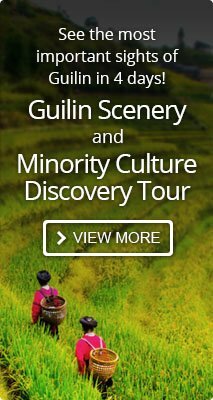 4-Day Guilin and Minority Culture Discovery Tour Explore the fantastic rice terraces, and experience the lifestyle of minorities, a Li River cruise, and the idyllic countryside of Yangshuo. Photographing the watery paddies and seas of cloud in spring at Longji. Mid May to early June: The rice terraces are water-filled and look like thousands of mirrors reflecting the blue sky, green hills, and mountains, presenting a marvelous view. Late September to early October: During this period, the rice on the terraces is ripe for harvesting, making the terraces look like carpets of golden yellow. 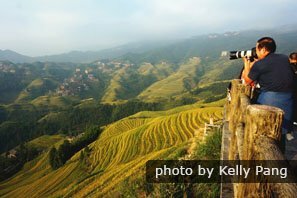 See more on Photography Tips for the Longsheng Rice Terraces. From mid-April to mid-June the fields are well-watered and you can see water glittering in the sun in spring. From mid-June to mid-September it is the growing period for the rice. You will green rice plants filling the paddies. From late September to early October, the rice is ripe. You will see layers of golden yellow. Farmers can be seen harvesting the fields from around October 1st to 15th. From mid October to April you will see nothing more than the plain scenery of brown empty fields (and maybe snow). 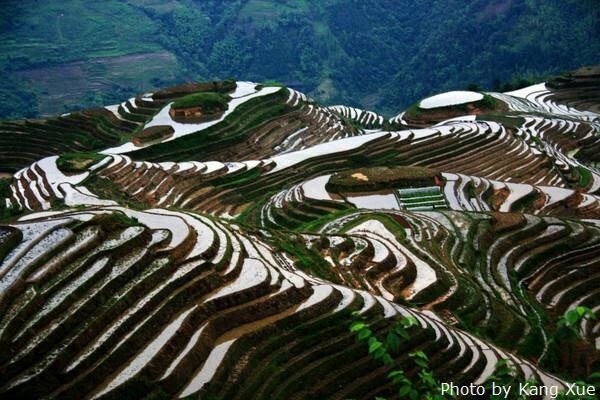 Longji Terraced Fields Scenic Area is 95 kilometers (59 miles) from Guilin. There are no direct buses from Guilin to Longji. The most convenient and time-saving way to get there is to take a private tour with a private car and driver. Unlike most other travel agencies who use the main road to save the toll, we use the expressway for a smoother, safer, and 30-or-so-minutes shorter journey. We can take you there within 2 hours. 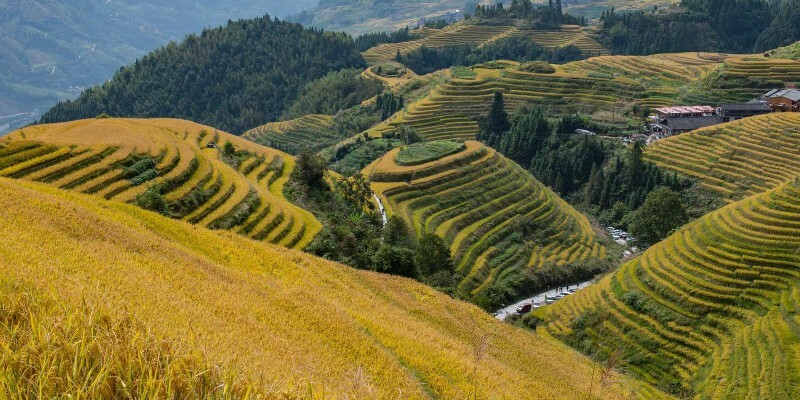 If you wish to go alone, you can take the express bus from Guilin to Longsheng County Town and then another bus from the town to the Longji terraces area. It takes about 3 hours. 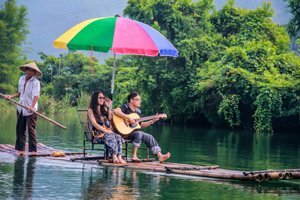 Alternatively, you can take regular bus at Guilin Qintan Bus Station and get off at Heping, a village before Longsheng, and then take a tourism bus to Ping’an or Dazhai. This takes even longer. The accommodation is mainly around Ping&apos;an, Dazhai, and Tiantou. It is quite basic. Most of the hotels are local stilted buildings, with a limited hot water supply. Some of the rooms have washrooms, some don&apos;t. You can really experience local life if you stay in a guesthouse. 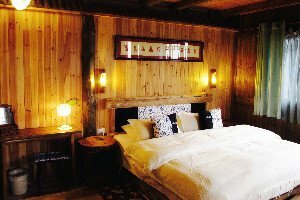 Here are some hotels we recommend based on our field inspections and our customers’ feedback: Longsheng Li An Lodge, Pingan Inn, Longji Panorama House Hotel. If you have heavy luggage, you can have it stored at the entrance of the scenic area. 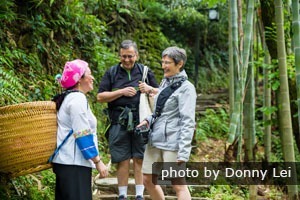 The local people will enthusiastically offer to help you carry your luggage up the terraces in back baskets. It is about 50 yuan per suitcase. 1. Touring the Longji Rice Terraces requires a whole day due to 2-hour’s driving per way and the huge size of the scenic area. 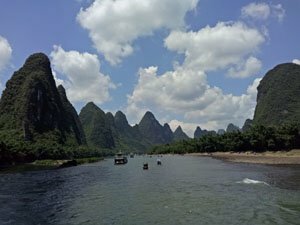 So, if you want to cover Yangshuo and Longji as well, you are recommended to have 4 days at least in Guilin. 2. Some travelers consider travelling from Yangshuo to Longji. We don’t recommend as it is a long drive, about 3 hours. It is more advisable to drive from Guilin. 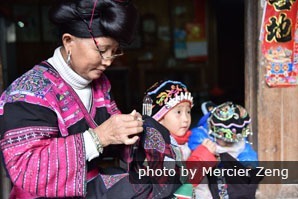 A Yao woman is embroidering. 3. 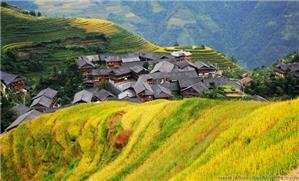 It is not recommended to arrange the Longji day tour on your departure day so as to avoid missing your flight. 4. If the limited condition of Longji’s accommodation doesn’t meet your requirement, you can get back to Guilin for overnight stay. 5. Some authentic experiences would enrich your Longji tour. We can help arrange a home-visit to a local’s house and create a chance for you to learn to make oil tea, bamboo-tube rice, or embroidery. 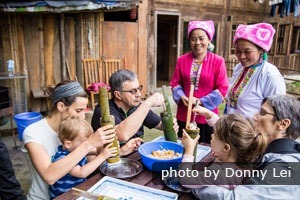 Our customers are learning to make rice cooked in a bamboo tube. Longji is full of beautiful scenery and ethnic customs. Travelling with us, you will not only see amazing scenery, but also have a chance to enjoy some authentic ethnic experiences.